Tuesday's what're they about? Monday starts the week, Wednesday's Hump Day, Thursday's payday for a lot of folk, Friday is T.G.I.F. and the S Brothers are the weekend - but what's Tuesday's claim to fame? I vote we nix it. Then we'll be one day closer to new comic day and the weekend - who's with me? Speaking of with - time to say 'gidday' to the latest IADW followers! Tom's the guy putting a touch of Charlie Brown to the followers list, which is good timing as Peanuts always makes me think of (Snoopy's) Christmas, and here we are racing through November! Bad Dog Tattoo is an Orlando based set of skin artists, whose mad skills with fresh ink you can check out right here on flickr or if you're in Orlando yourself, in person here. 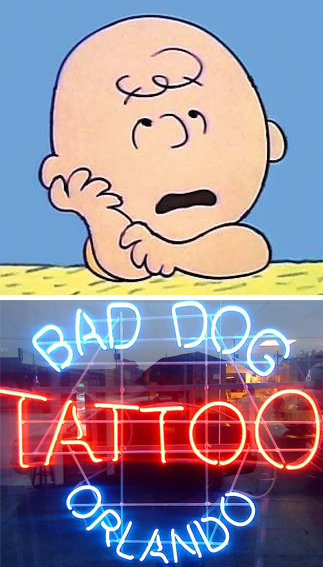 Welcome to IADW Tom and Bad Dog Tattoo - glad to have you aboard! Sorry Thomas - not sure were that came from! All amended and corrected now. Ha, no problem! Great site, always on the inside track when it comes to cool news and I especially dig your taste in art. Thanks for the great feedback Tom - glad you are liking what you find when you trek out to IADW.